1. Andrew chose to skip college in order to enter the 2005 NBA draft. 2. Upon his draft by the Lakers, he was the youngest player to play in the NBA. 3. Andrew is just shy of 7′. 4. His astrological sign is that of Scorpio. 5. Andrew is very active in the NBA’s Read to Acheive program and working with the Boys and Girls Clubs of America. Andrew Bynum (born October 27, 1987) is a professional basketball player for the Philadelphia 76ers. He was an All-Star and ALL-NBA selection during the 2012 season. He is widely considered one of the top centers in the game. Bynum grew up in New Jersey and chose to enter the 2005 NBA Draft in lieu of attending college. Drafted by the Los Angeles Lakers. with their 10th pick, Bynum was the youngest player ever to play in the NBA. Bynum missed much play time to due to injuries, but played hurt in the playoffs leading the Lakers to two NBA championships in 2009 and 2010. In 2011, he was traded from the Lakers to the 76ers as part of a four-team deal that included sending All-Star center Dwight Howard to Los Angeles. Bynum displayed flashes of dominance, but was not a consistent player. In a 2006 game against the Charlotte Bobcats, he had a career high of 16 rebounds and seven blocks. His first career double-double came on November 7 against the Minnesota Timberwolves when he scored a career-high 20 points and 14 rebounds – then on January 5th against the Denver Nuggets, he had 19 points, 10 rebounds. He then agreed to a 4 year contract with the Lakers on October 30, 2008. During the 2008–09 season, he went on to set a new career high in scoring with 42 points, 15 rebounds (8 offensive) and 3 blocked shots against the Los Angeles Clippers on January 21st. The following night against the Washington Wizards Bynum went on to score 23 points and 14 rebounds. In December 2011, in his first game back, he played 17 minutes, and was 1-of-5 from the field, seven points, four rebounds and two blocks. “I feel light-years better than back [in Game 7 of 2010 NBA Finals],” he said. During the first 24 games in which he played during that season, he averaged 24.6 minutes per game and 27.4 minutes in 17 games as a starter. Against the Dallas Mavericks, in the second round of the playoffs, Bynum was ejected in the final game of the Mavericks’ four-game sweep for a flagrant foul on J.J. Barea shortly after teammate Lamar Odom was ejected for fouling Dirk Nowitzki. Bynum’s actions caused him to be suspended four games for the next season and fined $25,000. On June 4, 2012, the Lakers exercised their $16.1-million option on Bynum’s contract for the 2012-13 season, he was later traded to the Philadelphia 76ers in a four-team deal. Andrew joined Celebrity Sweat in December 2011. Ray Lewis and Nelly pump-it-up in the gym. Andrew Bynum parachute sprints to fitness. 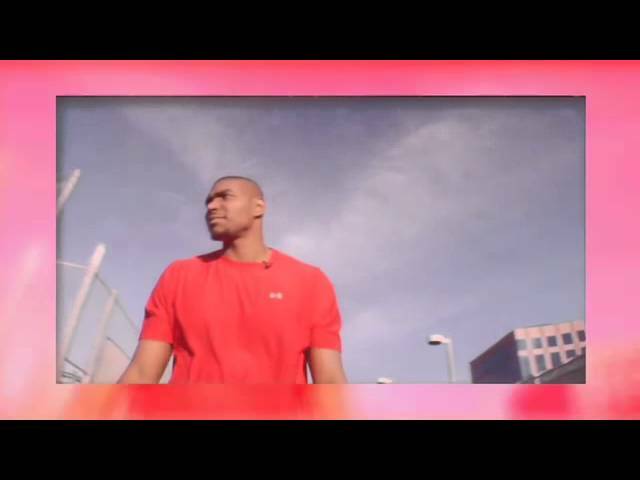 Celebrity Sweat and Andrew Bynum build stamina in the gym – for use on the court.